view of the red planet tonight, as Mars will appear bigger and brighter in the night sky than it has for the last 15 years. Throughout the month of July, the orbits of Mars and Earth have been steadily aligning in a rare phenomenon known as 'perihelic opposition', which occurs when Mars, Earth, and the sun align – with our planet in the middle. As a result, Mars will appear almost three times larger than normal in the night sky. According to Nasa, Mars' orbit only brings the red planet this close to Earth every 15 to 17 years, meaning the next time Mars will be seen as prominently in the night sky will be September 15, 2035. Stargazers all over the world will be able to see the red planet in all its glory today – provided they have clear skies. However, astronomers in the southern hemisphere will be treated to the best view as Mars will appear higher in the night sky. 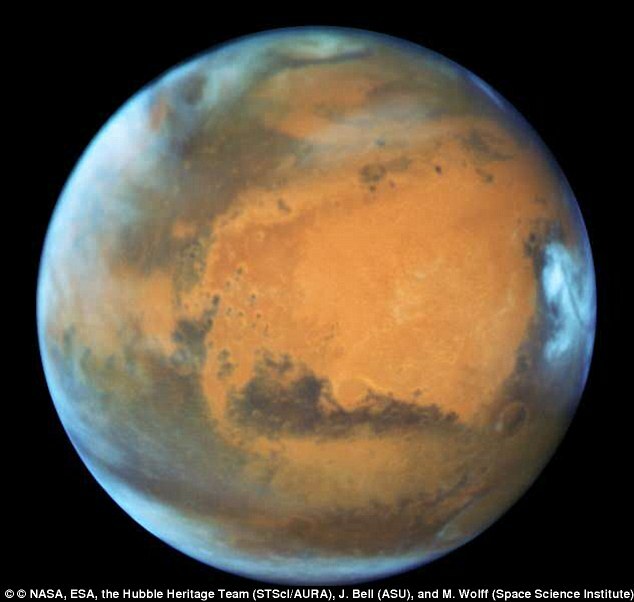 The exact moment of closest approach took place at 8:45am BST (3:45am EDT) July 31, however, Mars was invisible to amateur stargazers in Europe, Africa, Russia and Asia as it was daylight. As the sun sets later today, July 31, those looking up at the night sky with nothing but their naked eye will be treated to a stunning view of Mars. The perihelic opposition comes just a few days after another stunning celestial event, the 'Blood Moon' lunar eclipse, which saw people in Europe, Asia, Africa, parts of Australasia and South America treated to the longest lunar eclipse of this century, with our natural satellite taking on a deep crimson hue in the process. Earth is separated from Mars by an asteroid belt, with the typical distance between the two planets sitting at around 140 million miles (225 million kilometres). However, tonight that will drop to 35.78 million miles (57.59 million kilometres). For those in the northern hemisphere, Mars will appear to rise in the east just as the sun sets in the west, making the sunlit side of the planet visible throughout the night. Mars should be visible in the southeast, located just below the Sagittarius constellation, with Saturn also nearby. The best views will be visible in the hours before dawn. Those in the southern hemisphere will be treated to the best view of the perihelic opposition, as the red planet will appear higher in the night sky. On July 27, Mars will pass closer to Earth than it has done for 15 years. The rare event occurs when Mars reaches its closest point to the sun as the same time as Earth's orbit brings it directly between the two. Perihelic opposition can be seen with the naked eye, meaning there's no need for expensive equipment for stargazers to spot the rare event next month. It will outshine Jupiter, registering as some 1.8 times brighter in the night sky. Mars will be up all night, rising after sunset and setting at sunrise. Stargazers hoping to spot the red planet from the northern hemisphere should check the sky in the hours before dawn. Mars should be visible in the southeast, located just below the Sagittarius constellation. Meanwhile, the best view of the phenomenon will be enjoyed in the southern hemisphere. For example, New Zealand capital Wellington will enjoy a view of the red planet as it reaches a maximum altitude of 74 degrees in the sky at the end of July. For people unable to get outside or those with a view hindered by cloud cover, The Griffith Observatory in Los Angeles will air a webcast for the celestial event, which will be coupled with expert commentary. 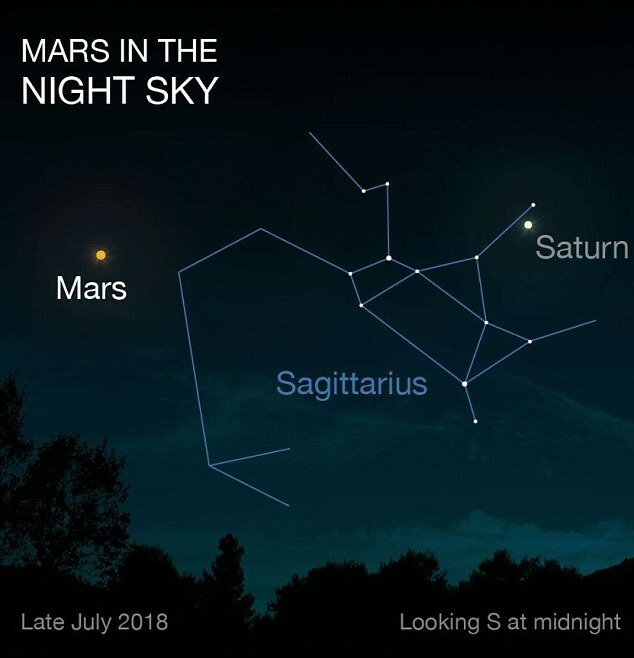 'The closeness and brightness of Mars, plus the near location of Saturn (Mars and Saturn were in conjunction in early April) should make this good to observe,' Dr Birkinshaw said. In the days before Mars Close Approach, the planet will look around three times brighter in our sky than it normally does. It will also outshine Jupiter, registering as 1.8 times brighter in the night sky. 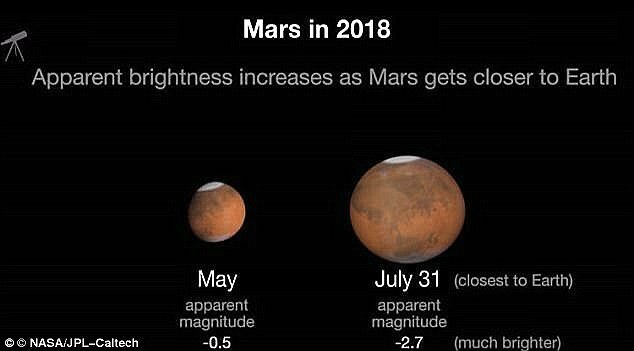 That means Mars will temporarily become the fourth-brightest object in the sky, ranking after the sun, the moon and Venus. Mars will be up all night, rising after sunset and setting just before sunrise. Opposition is a reasonably common occurrence, taking place once every 26 months. This is where Earth is sandwiched directly between the sun and Mars, in a similar fashion to the way it aligns itself with the moon each month. However, due to the variation between the orbits of Earth and Mars, opposition can happen anywhere along Mars' orbit. What makes this particular event so rare, is that the position of the Earth between the red planet and sun will occur within a few weeks of Mars' perihelion — the point in its orbit when it is closest to the sun. This coincidence, known as perihelic opposition, only happens every 15 to 17 years. The last time it happened was in 2003, and on that occasion the two planets were closer than they had been for almost 60,000 years. During that opposition, Mars was only 34.65 million miles (55.76 million kilometres) from the surface of our planet. This exact level of proximity will not happen again until until August 29 2287, according to some estimates.